You could say we've already reviewed the HTC Desire. After all, it's essentially a jumped-up Nexus One with a few minor changes, right? Wrong. HTC Sense, Adobe Flash support and an optical trackpad make it a brand new experience. Comparing the Desire to the Nexus One, you realize that both handsets have 3.7-inch WVGA AMOLED capacitive touchscreens, sport very similarly-sized bodies (though the Nexus One is a shade thinner, and has soft-touch keys), run Android 2.1, and include 5.0-megapixel cameras with LED flash. One of the main attractions is the fact that both handsets have Qualcomm Snapdragon QSD 8250 processors running at 1GHz—so they're extremely speedy to use. Inside, the Desire forgoes active noise cancellation, but has more RAM at 576MB compared to the 512MB the Nexus One has. So, small differences. The addition of HTC Sense is a biggie though. It's singlehandedly why I enjoy using Android so much—I just can't imagine owning a device with MOTOBLUR, Mediascape or S-Class. It changes the way you use Android, so in that aspect alone it's a completely different kettle of fish in comparison to the Nexus One. Unless you've already installed the Sense/Flash ROM on your Nexus One. 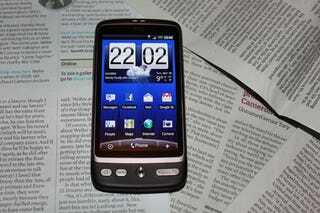 HTC's Legend is the only other handset running Android 2.1 with the updated Sense, which we ran through in our review. New features include the Mac OS X-like "Leap" function, social networking amalgamator FriendStream, and updated contact profiles. The Desire falls right in the middle of HTC design territory. It's got that slightly-rubberized back and metallic front down-pat, along with silver keys and a thin bezel. It's no Legend, with unibody aluminum casing, but it's a nice build and a great size—ideal for browsing. Being a keypad-fan, I'm always nervous when tapping out long emails on touchscreens, but actually I made fewer mistakes on the Desire than I have done on any other device—typing is a dream. The virtual keyboard is given more real estate, and due to the responsive nature of the touchscreen only a light tap or stroke is needed. But the speed of the experience just makes me wish that HTC had crammed all of the Desire's innards into the Legend. I know many people prefer the plastic, metallic bodies of the Nexus One and Desire, but after reviewing the aluminum Legend, the Desire feels every so cheaper in my hand. Hand feel alone isn't worth marking the Desire down—it has more than enough positives to outway a small personal preference concerning the materials used. Swapping the trackball of the Nexus One for the Legend's optical trackpad was a smart move as it provides a comfortable, accurate mousing experience. There are obvious reasons why HTC is moving away from trackballs (likewise, BlackBerry has discovered balls get dirt stuck underneath them and stop rolling correctly), and it proves very handy when editing text in an email. However, I didn't rely on the trackpad too heavily, as the touchscreen's response quality is just so superb, as is the speed of the processor—I didn't encounter a single problem with app loading time or switching between programs. Flash, Oooh Ahh, Savior Of The Universe? Adobe Flash 10.1 Lite support. That means the moving adverts on Gizmodo were visible—and websites with embedded video actually played it from either right within the Android browser, or in the Flash browser (which opens when you click on a video). YouTube, with its video taking up the whole screen, feels much like the dedicated YouTube app all Android phones (and iPhones) come with. I much preferred watching video in this dedicated Flash browser, as sometimes embedded video in the Android browser was far slower—even, dare I say it, buggy. (But that's Flash Lite for you!) Some sites' video refused to play at all, like BBC iPlayer, which depends on Shockwave Flash support. Cash registers haven't exactly been ringing the sound of Nexus One sales since its January launch, mostly thanks to a lack of knowledge surrounding the phone. HTC meanwhile has been very smart, creating an almost-identical HTC-badged phone, with only slightly upgraded spec. Given the choice, there's no two ways about it. Some may prefer Androids sans Sense, but that's easily uninstallable. HTC has pretty much shot the Nexus One in the kneecap by releasing the Desire...in the UK. There are no known plans as of yet to release the Desire in the US, which is a shame. The Desire is one of the fastest Android phones on the market. It has the best browsing experience, with the large responsive screen and addition of Flash. It has one of the best cameras found on an Android phone. It runs on the most intuitive, constantly-adapting operating systems available. It collates your social networking updates and contacts in the easiest and most efficient way possible. So yes, it's definitely worthy of your desire—however embarrassing the name may be.